My weight loss program is going well and I will post an update on this in a few days, but I wanted to share some of the small changes that I have started making. 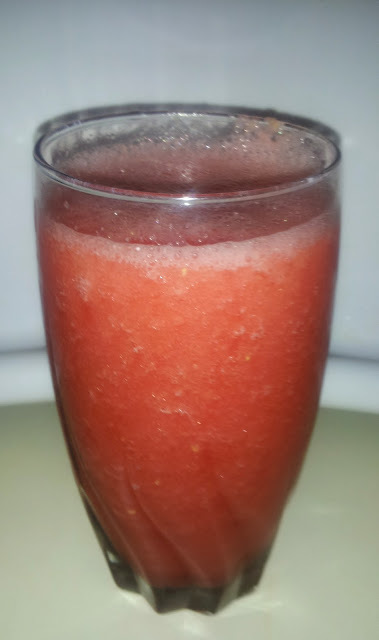 Watermelon juice is my first of many healthy food changes that I am introducing to my family. My hopes is that you will do the same whether you are taking Skinny Fiber and doing the 90 day Challenge or not. How to make watermelon juice ... It is so easy! You can juice or blend watermelon. Most prefer to blend the watermelon and keep the flesh in or strain it for a smooth juice. As you can see from the watermelon juice picture above, I did not strain the juice. I just cut the fruit off of the rind, blended it and served in glasses. I would have kept the rind on the watermelon if I was using a juicer, but I did not for blending because it make it a little bitter tasting. Where it is not particularly good for you body to eat the white and rind; it is ok to get the nutrients from those portions of the watermelon when juicing. The juicer squeezes them out. Others may prefer to include the rind in their watermelon juice, but I actually prefer to blend the watermelon and drink it this way for breakfast. It is not as thick or heavy as a smoothie, oatmeal or other foods, though watermelon juice is filling. This makes it the perfect breakfast food for those who are not big on eating breakfast at all. Eat watermelon (all melons) on an empty stomach for optimal digestion. Another reason for starting the day with watermelon juice is that it is best to eat watermelon on an empty stomach. This helps with proper digestion and your body will not get all of the watermelon nutrients if combined with other foods. This helps with body cleansing which is particularly helpful for people that have irritable bowel syndrome (IBS). Remember, poor digestion equates to poor health. Watermelon juice on an empty stomach will insure that you are eating for good health. How many calories and vitamins are in watermelon juice? 1 cup of pure watermelon juice is about 76 calories. It is rich in antioxidants like lycopene (protects from the sun) and beta carotene. Watermelon is an alkaline food. 1 cup of pure watermelon juice also has 276.0 mg of potassium, 5g sodium, 17 grams of carbohydrates, 1 gm fat and also has percentages of Calcium, Thiamin, Vitamin B6, Vitamin A, Phosphorus, Iron, Vitamin E, Riboflavin, Zinc, Copper, Magnesium and about 1/3 of daily percentage of vitamin C.
Watermelon is 90% water, therefore it is extremely quenching and beneficial for hydration. It will make you go to the bathroom. This is not uncontrollably, though watermelon juice is great for a daily cleansing and for detoxing. Would you believe that watermelon has ZERO grams of sugar? The fact that watermelon has no sugar just blows me away. How about you? So, I bet you're wondering how watermelon has such a sweet taste ... Well, the ZERO sugar means that it does not have the bad sugars that affect diabetics. It has a natural sugar that is so low there is no need to worry. On the other hand, it is high in carbohydrates, so one should watch if counting carbs. The plus is that these are the "good carbs" we always hear about needing instead of the refined carbohydrates from processed foods and breads. What are the other healthy benefits of eating watermelon and drinking watermelon juice? In addition to all of the healthy benefits stated above, watermelon is also a beautiful fruit for helping people with fatigue, depression, blood pressure, diabetes, and weight loss. Let me know if you were influenced to try watermelon juice and other thoughts in the comment section below. I love getting your feedback! I love watermelon juice. How many glasses can we take per day in a week? PS: I am trying to lose my weight. Useful post by the way. Nice to learn the benefits of watermelon. Thank you, James. I am glad this was helpful to you. You can drink watermelon juice daily. It is known to aid in weight loss, as well as the other health benefits for those with diabetes, high blood pressure, etc. I am so happy to read that watermelon is good for digestion. My son often suffers from digestion because of his awful diet. But now, that he is on a weight loss regimen after gaining almost 30 pounds in 3 months from a daily 600 calorie muffin in addition to a breakfast wrap each morning while working in a high stress job, he's embarked thanks to his gf on an exercise routine and I've started making healthy juices and smoothies for him. Watermelon, strawberry, blueberry juice is one of his favorites. I heard watermelon is also particularly healthy for men for their prostate. Well, suffice to say, he and my husband love the watermelon drinks. I will also keep in mind that its best on an empty stomach and will serve it for breakfast. Thank you. You're welcome. I love blueberry juice as well; especially with a little greens in it. Come on people...Juice the whole watermelon! The rind is where all the nutrients are! LOL, you're right, Larry. I just like it sweet. Awe, I am glad you tired and liked the watermelon juice. Thanks for sharing :) You can store for up to 2 days, but made fresh daily is best.